It would be blasphemy if we didn't see a Kobe shoe sporting the Lakers colorway, even though he is no longer playing in the NBA. Kobe is arguably one of the greatest Laker ever. 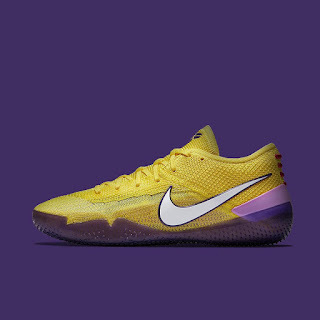 Because of that, the Kobe AD NXT 360 will carry the said tradition of the Lakers with this colorway. Yellow knit upper which has a 360 degree construction was used and you can see the different knit thickness which is very interesting since Nike isn't shy to showcase the whole build of the shoe which somewhat shows that they are nearing to master the Flyknit in terms of construction. Inside is a drop-in midsole composed of Lunarlon and their latest foam cushion, React. Purple accents on the heel area as well as on the outsole and you can see the swoosh branding in white as well. The colorway is not for everyone, but if you are a fan of the Lakers, I'm pretty sure you will like this. The shoe is available now at Titan both in stores and online.